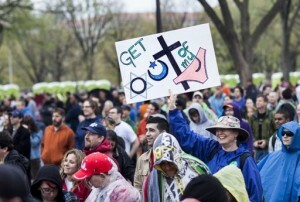 My wife and I were fortunate to attend, with 20,000 other secularists, the Reason Rally in Washington DC. What a wonderful experience being among those who feel it is important to be part of such a ‘coming out’ party. It wasn’t just a personal ‘coming out’ for individuals, but one for the entire nation. Who would have thought that such a event was even possible just a few short decades ago. But the intrusion of pious politicians has pushed those who want – as the sign says – to keep religion out of our private lives. The most popular secular speakers of our time were there as well as several musical acts, Tim Minchin being my favorite. There were booths, creative T-shirts, signs and even a 10 foot high Jesus. Yes it was cold and rainy – but the sun did come close to coming out – oops I said that phrase again! It was well worth attending such a large gathering of individuals who felt strongly that the act of simply standing to support others who think the same would be worth the trip, notwithstanding the weather and length of it (over 9 hours). I’ve never been to a rally before and didn’t know what to expect. But there’s a sense of pride that overcomes oneself when feeling like their presence makes a difference. That price, I’m sure, was felt by 20,000 people that day. I heard that Glen Beck had less people attending his rally – and that was on a sunny day! If there is another rally in the future I beseech you to attend it. You will not be disappointed.